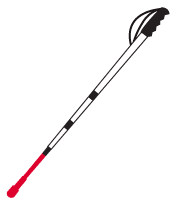 Most people who are blind and visually impaired use one or more aids for orientation and mobility, the white cane being one of the most common ones. You may think of your cane as merely a functional device and, indeed, it does fit that description. Your cane, however, is a part of you, something everyone else notices. Now thanks to Kustom Cane, you can own a cane that stands out from all the others, a cane that displays your personality and things that matter to you. Kustom Cane strives to provide canes that are safe. Every cane includes reflective material that makes you visible when traveling at night. Kustom Cane will add this reflective material to any cane you send to them even if you don’t buy a customized cane from them. Kustom Cane will personalize any type of cane and even offers to make customized harnesses for service dogs. When you visit the homepage www.kustomcane.com, you find a promotional video and a guide for determining which type of cane is best for you. You also find a place where you can purchase gift certificates and a listing of some of the new products Kustom Cane has to offer. You get a better idea about the company’s origin from the “About” page and notice that its founder used to work in restyling for the auto industry. When James, the company’s owner, lost his vision in 2010, he figured out that there was no variation in white canes, a fact that he sought to change. He believed that canes should reflect their owners in some way rather than just being “Boring white canes”. Kustom Cane has a page that is a gallery of pictures of many canes they have made; the gallery includes well-described images. The descriptions, by themselves, give you an idea of what kinds of customizations James can do. You can put the logo and/or colors of your favorite sports team on your cane, advertise a business or cause you care about by including their logo on a cane, choose colored handles that reflect your style, or add charms like Bluetooth speaker charms that actually do have audio output or alarm charms that sound an alarm if you need one. The best way to see all of Kustom Cane’s offerings, however, is to navigate to their “Order” page. After entering your demographic information, you begin designing your custom cane, determining your cane type, length, and color. Then you are asked to describe your custom cane; you will type as detailed of a description as you can. Next you select a cane tip and a charm from the list of over 20. Available charms include several butterflies with different sayings in braille, discs, guitar picks, stars, hearts, a dolphin, a football, and several more. There is a choice for “other” which allows you possibly to suggest one that is not on the list. Immediately following this combo box with the aforementioned charms, you can choose additional specialty charms which appear as a list of check boxes. This list includes USB battery charms (yes these are actual battery chargers for mobile devices), a hand sanitizer pump charm, several alarm charms, multiple Bluetooth speaker charms, or suggest a charm in the edit box below these choices. After you submit your order, Kustom Canes will contact you for a personal consultation so that they can make sure that your cane is exactly as you like it; they also make payment arrangements with you at that time. As you can see, these canes are far from ordinary. But Kustom Cane offers another fantastic program that you can be part of, whether or not you purchase a cane from them. This initiative is called the You Cane Give program. Thanks to the program, Kustom Canes has shipped canes to Nicaragua, and will ship some to Nigeria and the Philippines soon. You can get more information about Kustom Cane in several ways, visit www.kustomcane.com, email kustomcane@gmail.com, call James at 901-483-1515, visit their Facebook page at https://www.facebook.com/pages/Kustom-Cane/272840179481964, follow them on Twitter at https://twitter.com/Kustomcane, or visit their blog at https://kustomcane.wordpress.com/. As Kustom Cane’s slogan says: Don’t be plain, go Kustom Cane!